§ 425.060 Storm Water Management Permit Application. § 425.070 Storm Water Management Plan. § 425.090 Fee in Lieu of Storm Water Detention Facilities. § 425.100 Mitigation of Detention Facilities. § 425.110 Permit Application and In-Lieu Fees. § 425.120 General Design Requirements. § 425.130 Hydraulic Design Considerations. § 425.140 Storm Water Management System Design Requirements. § 425.150 Temporary Erosion Control Requirements. § 425.160 Rights-of-Way, Easements and Deed Restrictions. § 425.170 Maintenance Responsibilities for Storm Water Management Facilities. § 425.190 Illicit Storm Sewer Connections and Illegal Discharges. § 425.210 Penalties for Violation. § 425.230 Conflict With Other Provisions. Cross References — As to administration, Title I; as to building, ch. 500; as to building code, §§500.010 et seq. ; as to electrical code §§500.040 et seq. ; as to flood damage prevention, ch. 415; as to mosquito control, ch. 240; as to housing, ch. 515; as to land development standards for manufactured homes, §§405.120 et seq. ; as to planning and zoning, ch. 400; as to plumbing code, §500.060; as to streets and sidewalks, ch. 510; as to utilities, Title VII; as to subdivisions, ch. 410; as to zoning regulations, ch. 405. Section 425.060 Storm Water Management Permit Application. Section 425.070 Storm Water Management Plan. Section 425.090 Fee in Lieu of Storm Water Detention Facilities. Section 425.100 Mitigation of Detention Facilities. Section 425.110 Permit Application and In-Lieu Fees. Section 425.120 General Design Requirements. Section 425.130 Hydraulic Design Considerations. Section 425.140 Storm Water Management System Design Requirements. Section 425.150 Temporary Erosion Control Requirements. Section 425.160 Rights-of-Way, Easements and Deed Restrictions. Section 425.170 Maintenance Responsibilities for Storm Water Management Facilities. Section 425.190 Illicit Storm Sewer Connections and Illegal Discharges. Section 425.210 Penalties for Violation. Section 425.230 Conflict With Other Provisions. The purpose of this Chapter is to lessen or avoid hazards to persons and property caused by uncontrolled storm water runoff or by obstructions to drainage and to lessen the degradation of the quality of surface runoff. Unless specifically defined, words or phrases shall be interpreted so as to give them the meanings they have in common usage and to give this Chapter its most reasonable application. The term "shall" is always mandatory and not discretionary; the word "may" is permissive. Rainstorms of varying duration and intensities having a four percent (4%) probability of being equaled or exceeded in any given year. Rainstorm of varying duration and intensity having a one percent (1%) probability of recurring in any one (1) year. The duly appointed City Manager of the City or his/her designated representative. Any modifications, alterations or effects on a feature or characteristic of surface waters, including their quality, quantity, hydrodynamics, surface area, species composition, living resources, aesthetics or usefulness for human or natural uses which are or may potentially be harmful or injurious to human health, welfare, safety or property, to biological productivity, diversity or stability or which unreasonably interfere with the enjoyment of life or property, including outdoor recreation. The term includes secondary and cumulative as well as direct impacts. The record owner or his/her authorized representative of a tract of land that is the site of development or development activity within the scope of this Chapter. The elevation at any location delineating high waters having a one percent (1%) probability of being equaled or exceeded in any given year (also known as the 100-year flood). Any structure built for the support, shelter or enclosure of persons, animals, chattels or movable property of any kind. The maximum ability of a storm drainage facility to convey, detain or retain storm water flows without causing substantial damage to public or private property and in the case of a pipe, without surcharging. A natural or artificial open watercourse with definite bed and banks which periodically or continuously contains moving water or which forms a connecting link between two (2) bodies of water. Any channel, pipe, sewer or culvert used for the conveyance or movement of water, whether open or closed. An element of a discharge structure that allows the gradual release of water under controlled conditions. Design elevation of a discharge structure at which, or below which, water is contained behind the structure. The delay of storm runoff prior to discharge into receiving waters. A facility constructed or modified to restrict the discharge of storm water to a prescribed maximum range and to concurrently detain the excess waters that accumulate behind the outlet. A wet bottom detention basin is a structure designed to retain a permanent pool of water after having provided its planned detention of runoff during a storm event. A dry bottom detention basin is designed to be completely denatured after having provided its planned detention of runoff during a storm event. The temporary detaining or storage of storm water in storage basins, on rooftops, in streets, parking lots, school yards, parks, open space or other areas under predetermined and controlled conditions, with the rate of drainage therefrom regulated by appropriately installed devices. The volume of water equal to the difference between the control elevation of a discharge structure and the maximum level at which water can be accumulated prior to discharge times the average area of open surface storage (between the control elevation and maximum level) behind the discharge structure. Any individual, firm, corporation, association, partnership or other entity involved in commencing proceedings under this Chapter to effect the development of land for himself/herself or another. Any manmade change to improved or unimproved land including, but not limited to, buildings or other structures, mining, dredging, filling, grading, paving, excavating or drilling operations. Any subdivision of land as defined in the City's subdivision regulations, excluding minor subdivisions. The difference in rate and volume of storm water runoff from a parcel or project in its undeveloped natural condition and its developed condition is known as differential runoff. The rate of outflow of water from detention storage. Structural device, usually of concrete, metal, timber, etc., through which water is discharged from a project to the receiving water. The area from which water is carried off by a drainage system; a watershed or catchment area. An element in a drainage system which includes, but is not limited to, any of the following: conduits and appurtenant features, canals, channels, detention basins, ditches, streams, culverts, streets and pumping stations. The surface or subsurface system that conveys water from or over the land, including all watercourses, water bodies and wetlands (also referred to as the storm water management system or storm sewer). A grant by a property owner to the public, a corporation or a person of the use of land for a specific purpose. Height in feet above mean sea level according to National Geodetic Vertical Datum (NGVD). Saddle or low point facility located around the rim of a dammed impoundment such as a detention or retention basin for providing an efficient and safe means of convoying the maximum design flood discharge through the impoundment, without overtopping the dam. The volume and rate of flow of storm water discharged from a drainage area, which is or will be in excess of that volume and specified in this Chapter. The higher portion of the flood plain, immediately adjacent to and on either side of the floodway, occupied by quiescent or slow-moving waters during floods. The special flood hazard land adjoining a watercourse, the surface elevation of which is equal to or lower than the base flood elevation (the 100-year flood), which is subject to periodic inundation during floods. The channel of a watercourse and those portions of the adjoining flood plain that are reasonably required to carry and discharge the base flood. The elevation of floodwaters of a flood of specified frequency or occurrence at any given point. A surface which has been compacted or covered with a layer of materials so that it is highly resistant to infiltration of water; the term includes most conventionally surfaced streets, roof, sidewalks, parking lots and similar structures. A structure on or other alteration of land on a given site including, but not limited to, grading, street paving, storm sewers, sanitary sewers and utilities. A feature or structure for temporarily storing excess storm water originating at two (2) or more sites, having devices for controlling the rate of release of the stored water and located downstream of all sites where the runoff originates. A feature or structure for temporarily storing excess storm water, having devices for controlling the rate of release of the stored waters and located within the sites where the runoff originates. Design elevation of a discharge structure at which point, or above which point, water leaks out or bleeds out through a control device down to the control elevation. The maximum rate of flow of water at a given point in a channel or conduit resulting from a predetermined storm or flood. Those conditions which are expected to exist or do exist after alteration, resulting from human activity, of the natural topography, vegetation and rate, volume or direction of surface or subsurface flow. Those conditions that existed naturally prior to any manmade improvements or developments. This is assumed to be five percent (5%) impermeable over the entire site. Includes that portion of the watercourse whose total tributary area exceeds or equals fifty (50) acres and any drainage facilities therein. An engineer duly registered or otherwise authorized by the State to practice in their field of engineering. Any water body or stream into which surface waters flow. The plan, usually in map form, prepared pursuant to the Governing Body's zoning or other land development ordinances as a requirement for the development of property. The approved program of action for controlling storm water runoff and preventing harmful pollutants from being washed by storm water runoff from development on a property or subdivision. All natural and manmade drainage facilities which are defined as part of the storm water management plan. The waters derived from rain falling or snow melting within a tributary drainage basin, flowing over the surface of the ground or collected in a storm water drainage system, storm sewer or watercourse. As defined in Chapter 410, Subdivisions, of the Code of Ordinances of the City of Poplar Bluff, Missouri. The elapsed time for storm water to flow from the most distant point in a drainage basin to the outlet or point in question. Any stream, creek, brook, branch, natural or artificial depression, slough, gulch, reservoir, lake, pond or natural or manmade drainage facility in or into which storm water runoff and floodwaters flow, either regularly or intermittently. Any person, firm, corporation, business or government entity within the municipality shall apply to the administrative officer for approval of a storm water management plan, as defined herein, and obtain a storm water permit, waiver or exemption before commencing any development or development activity as defined herein. Any property to be annexed into the City shall be subject to these regulations. A storm water management permit, waiver or exemption shall be granted prior to final approval of annexation. Any redevelopment that will in any way alter the existing storm water management plan, including, but not limited to, any development that may increase the runoff from the site, alter the existing detention facilities, alter existing drainage facilities or any clearing operations that will require temporary erosion, control, shall require a storm water permit, waiver or exemption before any such activity begins. Detention requirements are directly related to permitted land use in the zoning ordinance of the City of Poplar Bluff. The permitted densities and minimum lot areas are important factors in the anticipated runoff. Table I lists the zoning districts with the major permitted use category, minimum lot area and the corresponding percent of imperviousness. For permitted land uses other than those listed in Table I, such as schools, churches, fire stations, etc., the rate of imperviousness shall be determined by the same method as for commercial uses listed in Table I. For conditional land use in any zoning district, the same ratio determination criteria shall apply. All developments or redevelopments of property within the City shall be subject to the provisions of the storm water management regulations. Written notice of intent to commence development shall be delivered to the administrative officer prior to undertaking any development activity, whether exempt from plan provisions or not. If exempt from plan provisions, a storm water management permit application shall be submitted for exemption. Applicants for exemption shall submit a storm water permit application for review and approval by the administrative officer. The application shall include all minimum information as required in Section 425.060. In addition, the application shall be accompanied by a brief description of the proposed improvements and construction activities. Applicants for exemptions will not be required to provide a storm water management plan or waiver certification by a professional engineer. The development is conducted in substantial accordance with the storm water management provisions contained in the development plan submitted with the final plat as approved. The property zone designation has not changed, unless it is determined by the administrative officer that the zone change will not create additional runoff beyond that allowed by the subdivision's storm water management plan. Development or redevelopment on isolated lots of record for single-family and two-family dwelling purposes may be exempt of a storm water management plan if the development does not involve: altering, rerouting, deepening, widening, obstructing or changing in any way existing drainage facilities; degrading the quality of water, adversely affecting any wetland or adversely affecting any sinkhole, watercourse or water body; or causing any negative impact on storm water runoff or down-stream storm water facilities or properties. The administrative officer may approve or deny any exemption based on the administrative officer's review of the proposed development or redevelopment. Applicants not meeting the requirements for an exemption may apply or reapply for a different type of storm water permit(s) according to the provision of this Chapter. Establishment Of Storm Water Management Fund. The storm water management program is established to protect the waterways and land in the City by controlling flooding and to protect the natural environment. In order to provide revenue to fund the costs of the storm water management program and to fairly allocate those costs, a Storm Water Management Fund ("the fund") is established. All revenues from grants, permit application fees, in lieu fees and other charges collected under the storm water management regulations ordinance shall be deposited to the fund. The Council may make additional appropriations to the fund. All disbursements from the fund shall be for the purposes of the fund as set forth hereinafter. The acquisition by gift, purchase or condemnation of real and personal property and interests therein necessary to construct storm water control facilities. Engineering and design, easement acquisition, debt service and related financing expenses, construction costs for new facilities and enlargement or improvement of existing facilities. Other activities which are reasonably required. Purpose. The purpose of the storm water permit and storm water management review process is to provide an organized framework for evaluating and acting upon proposals for development as they relate to storm water management issues. Required Information. It is the responsibility of an applicant to include sufficient information in the storm water permit application to enable evaluation of the environmental quality of the affected area, the potential and predicted impacts of the proposed activity on affected waters and the effectiveness and acceptability of the measures proposed by the applicant for preventing or reducing adverse impacts. The applicant shall furnish the administrative officer with the storm water permit application form and three (3) copies of the storm water management plan documents sealed by a professional engineer registered in the State. Type of permit applied for. Name of the project and legal description of the property. The name, address and telephone number of the applicant and the owner if different from the applicant. Name and address of the professional engineer, unless applying for an exemption. List of any additional permits necessary, applied for, approved or denied including, but not limited to, Corps of Engineers Section 404 Permit, Missouri Department of Natural Resources 401 Permit, FEMA Engineer's Certification of "No-Rise" and/or any other applicable permits necessary and related to storm water or flood plain development. Additional information. In addition to the minimum information required above, the applicant shall furnish three (3) copies of storm water management plan documentation required in Sections 425.070 through 425.100 where applicable. Storm Water Permit Application Standard Form. The applicant shall provide all information as required by this regulation and requested on the City storm water permit application standard form. A storm water management plan is designed to safely manage the storm water runoff following the rainstorms that exceed the maximum allowable release rate and the capacity of the storm water drainage system and/or the storm sewer system by detention of the excess storm water runoff. 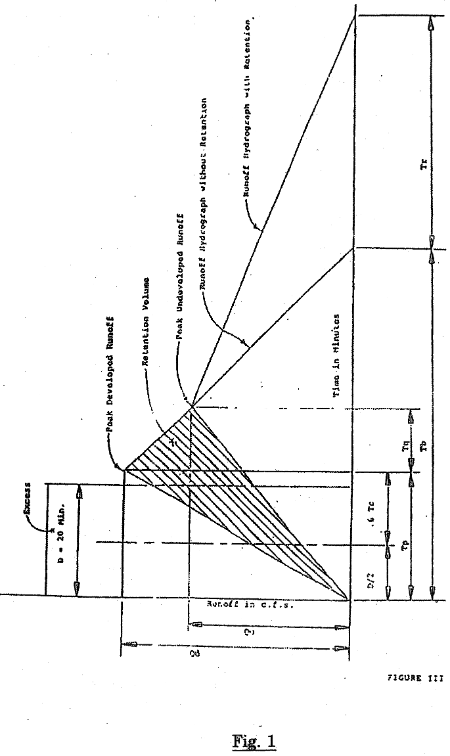 The plan shall provide or be accompanied by map(s) and/or drawing(s) at a minimum scale of one (1) inch less than or equal to two hundred (≤ 200) feet and other descriptive material, including the basis of computation, showing the following. Detailed location preliminary showing the parcel and major adjacent roads. Topographic map of the site at a scale of one (1) inch less than or equal to two hundred (≤ 200) feet with maximum five (5) foot contour intervals, except in flood plains or other areas of low relief where a smaller interval may be required. Where percolation or infiltration systems are proposed, information as to the location and type or vegetative cover and soil types and characteristics representative of the design condition mapped at a scale of one (1) inch less than or equal to two hundred (≤ 200) feet. Location of streams and other floodwater runoff channels, their normal channels and the extent of the flood plains at the established high water elevations and the limits of the floodway mapped at a scale of one (1) inch less than or equal to two hundred (≤ 200) feet. Location of lakes, ponds, swamps and detention basins indicating their normal shorelines, flood plains and lines of inflow and outflow mapped at a scale of one (1) inch less than or equal to two hundred (≤ 200) feet. Location of farm drains, inlets and outfalls, storm, sanitary and combined sewers and outfalls, septic tank systems and outlets, if any, and seeps, springs and flowing and other wells mapped at a scale of one (1) inch less than or equal to two hundred (≤ 200) feet. Location and description of nearby existing off-site water management facilities such as wells, lakes, drainage ways, etc., which are potentially directly affected by the proposed construction or development mapped at a scale of one (1) inch less than or equal to two hundred (≤ 200) feet. For all existing drainage facilities that are to be maintained, altered or enlarged as part of the storm water management system, provide information as to their size, slopes, depths, outfalls, receiving waters, elevations, cross sections, profiles, construction materials and other design details as applicable. Location of all new drainage facilities, including detention basins, to be constructed. Provide design details on each facility as applicable. Location of temporary erosion control measures, including silt fencing, temporary ditching, check dams and any other temporary erosion control measures necessary to prevent pollution of runoff during construction. Location and extent of existing and proposed impervious surfaces (roads, parking lots, building, etc.) and their elevations. Provide grading and paving drawing(s) and specifications. Location and extent of rights-of-way and easements for the storm water management system, including all areas to be dedicated for water management purposes. Identification and description of any special or required maintenance procedures to keep the project functioning as designed. Calculated hydrographs of inflow and outflow of design storm runoff for the project site under predeveloped conditions. Hydrographs of the runoff from the design storm for the project site under developed conditions. For all detention basins, a plot or tabulation of storage volumes with corresponding water surface elevations and of the basin outflow rates for those water surface elevations. Other data requested by the administrative officer. Runoff routing calculation showing discharge, elevations and volumes retained and/or detained during applicable storm event as required in Section 425.140. Calculations required for determination of minimum building floor and road elevations. Identify the entity responsible for operation and maintenance of the system. The administrative officer upon written supportive recommendation of the City Engineer or other designated official may waive the requirements for specific plan elements cited above. The storm water management plan for minor development activities may consist of a certification from a professional engineer that the differential runoff equals zero. Storm Water Conveyance Systems. No waivers shall be approved for storm water conveyance systems. All new or redevelopments shall provide for an on-site storm water conveyance system to carry runoff from the developed site and any pass through runoff from upper reaches of the drainage basin. New Development. Waivers for storm water detention systems may be approved for new developments where adequate justification can be provided showing that the post development runoff is less than or equal to the predevelopment runoff. Additional storm water detention on sites currently permitted and meeting the storm water management plan requirements may be waived if the redevelopment does not affect more than one thousand (1,000) square feet and does not adversely affect any existing storm water facilities. If the redevelopment involves more than one thousand (1,000) square feet of area, the applicant shall submit a new storm water management plan with accompanying documentation per Section 425.070 or an "in lieu" fee per Section 425.090. Upon completion of any redevelopment with waived storm water detention, the developer shall submit to the administrative officer certification that the existing storm water facilities were not adversely affected. Certification shall be sealed by a professional engineer registered in the State of Missouri. Required predevelopment site information as described in Section 425.070. Location and extent of rights-of-way and easements for the storm water management system, including all areas to be dedicated for storm water management purposes. Identify the entity responsible for operation and maintenance of the storm water system. City determines that the proposed improvements will have no major impact on downstream storm water facilities or watercourses. City determines that the limited relief on the site or other natural conditions of the site makes development of storm water detention facilities ineffective or uneconomical. Storm Water Conveyance Systems. This Section applies only to storm water detention facilities. Storm water conveyance systems shall not be eligible for payment of a fee in lieu of constructing storm water conveyance systems. Existing and proposed site information as required in Section 425.070(B) — (C). Hydrographs of inflow and outflow of design storm runoff under predevelopment conditions. Hydrographs of inflow and outflow of design storm runoff under developed conditions. Calculation of required in lieu fee per this Section. The mitigated facilities are located within the same drainage area upstream of the project site or downstream and adjacent to the project site. City determines that the proposed improvements will have no major adverse impact on downstream storm water facilities or watercourses. Storm Water Conveyance Systems. This Section applies only to storm water detention facilities. Mitigation of storm water conveyance systems shall not be considered. Submittal Requirements. All submittal requirements of Section 425.060 shall be necessary for both the project site and the site of mitigated detention facilities and any additional information deemed necessary by the administrative officer to ascertain the completeness and adequacy of the mitigated facilities and the impact on downstream storm water facilities and watercourses of both the project site and the site of mitigated detentions facilities. Identify the entity responsible for operation and maintenance of both the project site storm water management systems and the mitigated storm water management systems. Non-residential. One hundred seventy-five dollars ($175.00). Fee in lieu of detention. Non-residential. Two hundred dollars ($200.00). Residential. Two hundred dollars ($200.00). Non-residential. Two hundred fifty dollars ($250.00). Residential. Five hundred dollars ($500.00). Non-residential. Seven hundred fifty dollars ($750.00). Application fee payment shall be due at the time the application is submitted to the City for review. No review or consideration will be given until the correct application fee has been paid in full. All storm water management plan documents (excluding applications for exemption) shall be prepared under the direction of a professional engineer prior to the submission of the storm water management permit application to the City. All fees for such review and evaluation shall be paid by the property owner or developer directly to the engineer and the engineer shall certify that he/she has reviewed the proposed storm water management plan documents and that said plan documents conform with all design requirements and other requirements imposed by this Chapter. Up to fifteen thousand (15,000) cubic feet of required storage: Sixty cents ($0.60) per cubic foot. Fifteen thousand (15,000) to thirty-five thousand (35,000) cubic feet of required storage: Forty-five cents ($0.45) per cubic foot. Thirty-five thousand (35,000) to sixty-five thousand (65,000) cubic feet of required storage: Thirty cents ($0.30) per cubic foot. Over sixty-five thousand (65,000) cubic feet of required storage: Twenty cents ($0.20) per cubic foot. In-lieu of detention fee payment shall be due upon completion and approval of the in-lieu of detention storm water management permit. Building permits will not be issued for a site until the in-lieu of detention fee has been paid in full. The administrative officer will ascertain the completeness of the storm water management permit application. The administrative officer will return incomplete applications to the applicant for completion and resubmission. After determining that the application is complete, the administrative officer will distribute copies of the application for review and comment to other persons with special technical expertise as deemed appropriate by the administrative officer. Within twenty-one (21) business days after submission of the complete storm water management permit application by the applicant, unless review by an outside consultant is required, the administrative officer shall approve, approve with specified conditions, request additional information/clarification or deny the application and shall notify the applicant accordingly. If the storm water management permit application is denied or approved with conditions, the administrative officer shall state the reasons for denial or the specified conditions. If review by an outside consultant is required, the administrative officer shall notify the applicant of the outside review and shall respond to applicant within ten (10) business days of receiving a final report from the consultant. If the applicant feels aggrieved due to the denial or conditions, he/she may appeal the decision according to the provisions established in Section 425.200 (B). In addition to the application fee as denoted above, an additional fee equal to the original application fee may be charged for excessive submittals. The term "excessive submittals" is defined as three (3) or more resubmittals on the same project based on review comments by the City. A storm water management system shall be provided for protecting lots, roads, streets and buildings in the project area from the potential adverse impacts of storm water runoff. Streets, blocks, depths of lots, parks and other public grounds and ultimate land usage shall be determined, located and laid out in such a manner as to reduce the velocity of overland flow and allow the maximum opportunity for infiltration of storm waters into the ground and to preserve and utilize natural streams, channels and detention basins and, whether possible, to include streams and flood plains within parks or other public grounds. Minimum Detention Volume. The increased storm water runoff resulting from the proposed development shall be detained on-site by appropriate detention structures. The minimum volume of storage shall be sufficient to store the volume from a 25-year storm under the proposed developed conditions. Acceptable detention structures shall include dedicated storm water detention basins; storage on flat roofs, parking lots or streets; or by other acceptable techniques approved by the administrative officer. Control devices shall be incorporated to regulate discharge from storage in accordance with the provisions of this Chapter. Maximum Allowable Release Rate. The maximum allowable release rate of storm water after development shall not exceed the before-development rate for each rainfall event considered. Downstream property, watercourses, channels or conduits shall not receive storm water runoff from proposed development at a higher peak flow rate than that which existed prior to the development. Primary Outlet Release Rate. Detention basin control structures shall be designed to release runoff at a flow rate not to exceed ninety percent (90%) of the peak flow rate calculated for a 25-year frequency storm, under predevelopment conditions, when the detention basin water level is equal to the level required to store the minimum detention volume. This flow rate shall be defined as the primary outlet release rate. The primary outlet release rate shall not be exceeded prior to detaining one hundred percent (100%) of the minimum detention volume in storage. The total drainage area must be used in calculating the release rates. The required storage volume will be based on the project area only. Extraneous flows from upland areas shall be by-passed or discharged via overflow spillway or other devices. In a depressed median of a double roadway, street or parkway provided the median is wide enough to permit required roadway shoulders. Centered on the rear lot lines in a block or entirely within the rear yards of a single row of lots or parcels, provided that in either case the lots are deep enough to permit side slopes in the runoff channel and a building site of the elevation required by other Sections of this Chapter. In a depressed area along roadway, street or parkway provided the area is wide enough to permit side slopes as required in other Sections of this Chapter. Alternative systems such as curb and gutter and storm sewers that discharge into an appropriate detention basin may be incorporated into the storm water management plan. The smaller, uppermost reaches of drainage channels and swales forming the natural drainage system near a watershed divide may be relocated or eliminated and incorporated into the planned system of storm sewers and open channels designed consistent with the requirements of this Chapter. A continuous easement may be provided abutting rear lot lines as shown in the storm water management plan drawing(s) within which utility lines and open drainage facilities may be located and maintained, but on which no accessory buildings may be constructed. The utility drainage easement shall be as specified in Section 425.160. Within the area so designed for the passage or storage of waters, no structure may be erected, no fences, shrubbery or trees planted or changes made to the prescribed grades and contour of the specified floodwater or storm water runoff channels. All storm sewer outfalls shall be so designed, by reason of elevation of the invert, by a flap gate or by other features, that when the receiving stream is in full flood, the storm sewers will continue to drain the areas they are designed to serve unless the provision is made for sewer back-ups into planned storage locations. All sanitary sewer manholes constructed in a flood plain, in a street designed to provide detention or in an area designed for the storage for passage of floodwater or storm water shall be provided with either a water-tight bolted manhole cover, a water-tight concealed pick-hole cover or be constructed with a rim elevation at or above the high water elevation of the 100-year flood or the high water elevation of the design storm, whichever is applicable to the specific area. No sanitary sewer manholes shall be constructed in an area designated for storm water detention where other feasible locations exist. Projects that are to be developed in phases will normally require the submission of a master plan of the applicant's contiguous land holdings. Applications for individual project phases may be considered only when the phases are totally independent of, or make sufficient provisions for, adjacent lands. The administrative officer may require alternative designs or features to reduce the cost of long-term maintenance. In critical areas, the administrative officer may require additional hydraulic capacity above the minimum set forth above. Method Of Evaluation. Differential runoff evaluation consists of the determination of rates of runoff before and after development, the determination of required volume of detention and verification of adequacy of discharge and control structures. Volume of detention for projects of less than twenty-five (25) acres shall be evaluated by the "simplified volume formula". Volume of detention for projects of twenty-five (25) acres or greater but less than two hundred (200) acres may be evaluated either by the "simplified volume formula" or the "modified rational hydrograph method". For projects larger than two hundred (200) acres, the owner's engineer shall submit his/her proposed method of evaluation for the sizing of the detention basin to the administrative officer. The method will be evaluated for professional acceptance, applicability and reliability. No detailed review for projects larger than two hundred (200) acres will be rendered before the method of evaluation of the detention is approved. Other analytical methods of evaluation of volume of detention will be considered, provided that reliability, professional acceptance and proper application are approved by the administrative officer. Total peak runoff of developed project in cfs. Total peak runoff of unimproved project in cfs. Determine the time of concentration for the project by use of Figure 2 (following Section 425.270) or similar reference manual adopted by the City Engineer or other designated official. 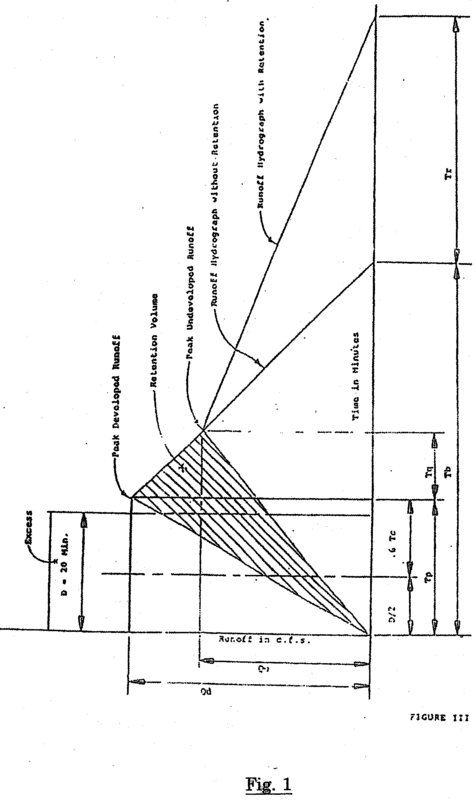 Figure 2 is based on overland flow time from Seeley Data Book for Civil Engineers. Enter chart with overland travel distance; follow horizontally to slope curve then vertically down to C or P factor listed in Table II and obtain Tc. For analysis of large improved channels, time for travel for overland flow and channel are to be analyzed to determine reasonable (Tc) time of concentration. Control Structures. Detention facilities shall be provided with obvious and effective control structures. Plan view and sections of the structure with adequate detail shall be included in the drawing(s). Provision shall be made to protect clogging of outlets by debris and/or silt. Access to control structures shall be provided for maintenance and inspection. Control structures shall be designed to regulate water discharges at the primary outlet discharge rate and the low-flow discharge rate. A rating table recording the relationship among detention facility water elevation, stored volume and discharge flow rate shall be provided on the drawing(s) clearly indicating the numeric values at the two (2) design flow rates. Primary outlet discharge rate. The primary outlet discharge rate shall be calculated as ninety percent (90%) of the peak flow rate determined for a rainfall event (storm) having a 25-year return frequency, with a duration equal to the time of concentration for the drainage basin watershed, under predevelopment conditions (five percent (5%) imperviousness). The primary outlet discharge rate shall not be exceeded prior to the detention structure detaining one hundred percent (100%) of the minimum detention volume. Low flow release rate. The low flow release rate shall be calculated as twenty-five percent (25%) of the peak flow rate determined for a rainfall event (storm) having a 25-year return frequency, with a duration equal to the time of concentration for the drainage basin watershed, under predevelopment conditions (five percent (5%) imperviousness). The low flow discharge rate shall not be exceeded prior to the detention structure detaining fifty percent (50%) of the minimum detention volume. When emergency overflow structures are combined with control structures, the control structure shall be sized to safely pass the 100-year flood under current runoff conditions, but not less than thirty-five percent (35%) impermeable for the entire drainage area considered. The overflow opening or spillway shall be designed to accept the total peak runoff of the improved tributary area. Consideration shall be given to anticipated land use upstream of the control structure when determining the peak 100-year flood runoff. Detention Design Criteria. Detention in the overall system, including swales, lakes, canals, greenways, etc., shall be provided as follows. Storage volumes. The minimum volume of storage provided in detention basins, together with such storage as may be authorized in other on-site facilities, shall be sufficient to store the volume from a 25-year storm (under developed conditions). Outlet control structures. Outlet control structures shall be designed to operate simply and automatically. They will limit discharges into existing or planned downstream channels or conduits so as not to exceed predetermined maximum authorized peak flow rates. Outlet control structures shall be designed to safely discharge flows no greater than the primary outlet release defined in Section 425.120(D) and when the basin water level is at the 25-year storm level. Emergency spillway. Emergency overflow facilities must be provided in all instances so that stored waters will not exceed the safe capacity of the basin. At a minimum, the emergency spillway must be able to pass, without damage, the 100-year storm. Low flow channel. The low flow channel invert through dry detention facilities on other than permanently flowing streams shall be paved. Designs should result in aesthetically pleasing configurations which will enhance public acceptability. Perimeter maintenance easements of fifteen (15) feet (minimum) width at slopes no steeper than 3:1 (horizontal to vertical) shall be provided. Vegetated side slopes of the facility shall not be steeper than 3:1 (horizontal to vertical). Paved side slopes steeper than 3H:1V or retaining walls may be allowed provided that adequate safety precautions are provided around the entire perimeter. Paved slopes shall be designed to eliminate vegetation growth and minimize cracking. Provisions must be incorporated to facilitate complete interior drainage to dry bottom basins, to include the provision of natural grades to outlet structures, longitudinal and transverse grades to perimeter drainage facilities or the installation of subsurface drains. Multi-purpose features may be designed to serve secondary purposes for recreation, open space or other types of use which will not be adversely affected by occasional or intermittent flooding. In no case shall the limits of maximum ponding elevation be closer than twenty-five (25) feet horizontally from any building and less than two (2) feet vertically below the lowest sill elevation. The entire reservoir area shall be seeded, fertilized and mulched, sodded or paved. Perimeter maintenance and operation easements of fifteen (15) feet (minimum preferable) width at slopes no steeper than 3:1 (horizontal to vertical) shall be provided. Control elevations should be no higher than two and one-half (2½) feet below the minimum road centerline elevation in the area served by the control device in order to protect the road subgrade when structures are constructed near roads. Vegetated side slopes shall not be steeper than 3:1 (horizontal to vertical) out to a depth of two (2) feet below the control elevation, then as steep as soil stability will allow. If fish are to be used to help keep the basin clean, at least one-quarter (¼) of an area of the permanent pool must be a minimum depth of ten (10) feet. For emergency purposes, cleaning or shoreline maintenance, facilities shall be provided or plans prepared for the use of auxiliary equipment to permit emptying and drainage. The limits of maximum ponding elevations are to be no closer than twenty-five (25) feet horizontally from any building and no less than two (2) feet below the lowest sill elevation of any building. Impervious areas. Paved parking lots may be designed to provide detention storage of storm waters on all or a portion of their surfaces. Outlets will be designed so as to slowly empty the stored waters and depths of storage must be limited to a maximum depth of twelve (12) inches so as to prevent damage to parked vehicles. Ponding should be regulated to those portions of the parking lots farthest from the area served. Rooftop storage. Detention storage requirements may be met in total or in part by detention of flat roofs. Details of such designs, to be included in the storm water management permit application, shall include the depth and volume of storage, details of outlets devices and down- drains, elevations of overflow scuppers, design loadings for the roof structure and emergency overflow provisions. Underground storage. All or a portion of the detention storage may also be provided for in underground facilities, as long as all applicable requirements of this Chapter are met. Details of such designs are to include type of facility, depth and volume of storage, details of inlet and outlet devices and locations, emergency overflow provisions and measures to be used for surface and ground water pollution control. Design alternatives. The above listing of design criteria is not intended to preclude the use of other known state-of-the-art methods and available best management practices and should not be construed as a mechanism to discourage innovative design concepts. The applicant shall show the flood plain and floodway on the storm water management plan. All applicable zoning and subdivision requirements. All applicable building code requirements. All requirements of other Federal, State or local agencies exercising jurisdiction over the area. Alterations Affecting Flow. The applicant shall not alter any channel from conveying, in its post-development state, the same amount of flow, at the same or lower maximum water elevation that is conveyed in its predevelopment state. Typical cross sections of the existing and proposed channel. Plan view of the channel showing the location of existing constrictions, obstructions and other non-typical areas. 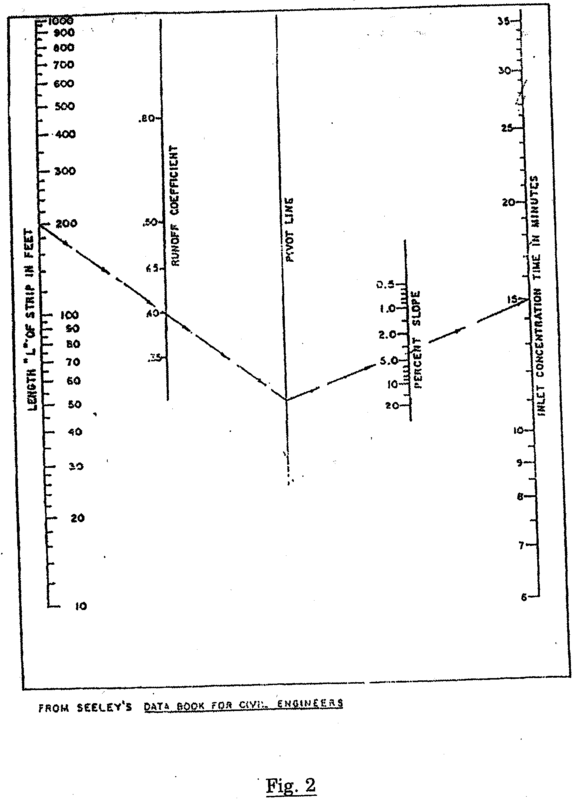 Hydrographs and/or flood routing calculations and backwater curve profiles of the proposed waterway corresponding to a storm recurrence interval of one hundred (100) years. Engineering evaluation of all potential increases in flood hazards to the adjacent upstream or downstream private or public lands and facilities located thereon, showing provisions for eliminating any and all adverse impacts on such land and facilities at no public cost. Minimum finished floor elevations which shall be set at or above the maximum water surface elevation as determined by either or both of the following. "Flood Insurance Rate Map" published by the Federal Emergency Management Agency; or backwater curve profiles of the proposed waterway due to a 100-year storm recurrence interval. Designation on the final plan view drawing(s) of all areas reserved for flood routing, detention or storage, together with the required wording pertaining to restrictions, dedications and maintenance responsibilities of such areas. Credit For Detention Storage. If detention storage is provided within a flood plain, only the net increase in storage volume above that which naturally existed on the flood plain shall be credited to the development. No credit will be granted for volumes below the elevation of the regulatory flood at the location unless compensatory storage is also provided. For projects of fifty (50) acres or greater but less than two hundred (200), routing calculations shall be submitted in legible tabulated form. Proof of adequacy of volume of detention and sizing computations for low-flow structure shall also be submitted. Features of stability and safety may also need to be documented if the scope of the project requires special attention in this area of design. Projects over two hundred (200) acres in area shall provide documented verification of adequacy according to scope and complexity of design. From Midwestern Climate Center Research Report 93-03, Bulletin 71: "Rainfall Frequency Atlas of the Midwest" by Floyd A. Huff and James R. Angel, 1992. Installation Of Storm Water Runoff Control Measures. Positive storm water runoff control shall be provided for during development. Storm water management plans shall include a schedule for the installation, construction or modification of all drainage facilities. Erosion control measures and a schedule for their installation shall be shown on the storm water management plan drawing(s). Installation of drainage facilities and erosion control measures shall proceed as scheduled in the approved storm water management plan. Design Requirements For Soil Erosion Control During Construction. Narrative report describing the nature and scope of the work. The plan shall be prepared and certified by a registered professional engineer licensed in the State of Missouri. All surfaces must be stable and non-erosive within the lesser of thirty (30) working days or sixty (60) calendar days after completion of the work authorized by the permit for a storm water management plan. When such work is associated with the construction of a building, no certificate of occupancy shall be issued until such surfaces are stable and non-erosive. If completion of the work or building is at such time of the year that stabilization with ground cover is not possible, a performance bond or other acceptable financial instrument for completion of the work may be accepted to allow the issuance of a certificate of occupancy. The amount of the bond shall be equal to the cost to complete the work as determined by the City administrative officer. Grading, erosion control practices, sediment control practices and waterway crossings shall meet the design criteria set forth in the most recent version of "Protecting Water Quality - a field guide to erosion, sediment and storm water best management practices for development sites in Missouri and Kansas" (as provided by the Missouri Department of Natural Resources) and shall be adequate to prevent transportation of sediment from the site to the satisfaction of the administrative officer. Site Grading And Drainage Drawing(s). A drainage area map showing topography of the entire drainage basin(s) contributing to the site. The scale of the map shall be no smaller than 1 inch = 200 feet for drainage areas up to five hundred (500) acres. The drainage map is to show total acreage of the site and the acreage of all drainage areas contributing to the site. A site plan drawing(s) having a scale no smaller than 1 inch = 100 feet and existing contour intervals of not more than five (5) feet. The drawing(s) shall show topographic features such as highways, utilities, natural watercourses, existing drainage facilities and structures, adjacent property lines, north arrow, scale and vicinity map. The site plan drawing(s) shall also show the limits of the 100-year flood plain on the site and any critical environmental areas such as streams, lakes, ponds and wetlands. Area and geological types of predominant soils as well as the nature and extent of existing vegetation shall also be shown on the drawing(s). Proposed alterations of the site. A grading plan drawing(s) that shows the limits of clearing and grading, cuts and fills and final contours at not more than two (2) feet intervals. The drawing(s) shall identify the phasing of the grading, showing the area(s) to be denuded and the maximum time those areas will remain disturbed (not to exceed the lesser of thirty (30) working days or sixty (60) calendar days after completion of the work). The drawing(s) shall show areas to be used for storage of topsoil and excavated subsoil and plans for access to the site during wet weather. A final site plan drawing(s) showing the location or relocation of all utilities, planned streets, roads, buildings, parking lots and structures and all permanent storm water management facilities. Temporary erosion and sediment control measures during active construction. Drawings shall be provided showing types of erosion and sediment control measures and facilities needed and the location of those measures and facilities with dimensional details. All permanent deviations in overland flow drainage patterns and the location of ingress and egress points with the planned protection provisions are to be indicated. The report shall briefly describe the overall project and shall incorporate an explanation of existing significant drainage problems contributing to erosion and siltation problems, particularly those that will be intensified by alteration of the site due to construction. Explanations for the selection of the soil erosion control measures to be utilized shall be provided. The phasing or staging of development activities that will disturb the land is to be described, including information on the sequence of the work; specifying the maximum area and time span that each area will be left denuded; the provisions for the removal, protection and stockpiling of soil; the types of major earth moving and grading activities; dust control measures; and the order of placement of control facility installations. A schedule shall be provided for inspection and maintenance of the temporary soil erosion and sediment control measures to insure maximum effectiveness and to assure that maintenance efforts will be carried out when needed. The report should also include a description of the disposal of temporary structural measures after they have served their purpose. A description of permanent erosion and sediment control measures, including plans for resodding or reseeding of vegetated areas and repair or reconstruction of damaged structural measures. Grading and pavement permits. No permit for grading or constructing any public street shall be issued until the temporary erosion control measures set forth in the site grading and drainage plan have been properly installed. Temporary erosion control measures. The temporary erosion control measures described in the site grading and drainage plan shall be properly installed prior to commencement of any construction or land disturbance activity and shall be properly maintained at all times until all land surfaces on the property become stable and non-erosive. Easements must include the "top of the bank width" and the maintenance access width. The maintenance access width begins at the point of the bank or slope of the facility. The maintenance access width may be required by the administrative officer in special circumstances where more width on one (1) or both sides is necessary for maintenance purposes. Deed restrictions shall be provided for subdivision lots to restrict use of land designated for storm water detention facilities and drainage facilities. Recorded subdivision plots shall detail all easements and deed restricted areas. Prohibit any activity that results in a reduction in the storage volume of the detention basin or that results in an increase to the discharge from the outlet works. Prohibit building on restricted area. Prohibit any activity that will compromise the function of the storm water management system. Prohibit modification to the outlet structure, other than modifications to improve its aesthetic appearance (e.g., brick, signage, painting, etc.). Purpose. The purpose of this Section is to establish maintenance standards to ensure that, after storm water management facilities have been properly designed and constructed, they continued to function properly. Continued proper functioning is highly dependent upon the proper maintenance of the facilities. Design Of Facilities. Maintenance costs over a period of years will generally surpass the costs of initially constructing water management facilities. The applicant and the administrative officer should utilize all appropriate methods, approaches and techniques to design and construct these facilities in such a manner that fulfills the requirements of this Chapter, facilitates their inspection and minimizes future maintenance costs. Maintenance Responsibilities. The growth of noxious weeds, the creation of conditions which support the growth of mosquitoes and other insects and the decrease in available storage by accumulated sediments shall be controlled. The cleanup of accumulated debris, flotsam and other materials after runoff events have subsided shall be assured. Detention facilities, when mandatory, are to be built in conjunction with the storm sewer installation and/or grading. Since these facilities are intended to control increased runoff, they must be partially or fully operational soon after the clearing of the vegetation. Silt and debris connected with early construction shall be removed periodically from the detention area and control structure in order to maintain close to full storage capacity. The responsibility for maintenance of storm water management facilities in single lot development projects shall remain with the owner, developer and general contractor until final inspection of the development is performed and approved and a legal occupancy permit, where applicable, is issued. After legal occupancy of the property, the maintenance of storm water management facilities shall be vested with the owner of the property. The responsibility for maintenance of storm water management facilities in subdivision projects shall remain with the developer "until such time as responsibility is transferred, under appropriate legal arrangements, to the private individual owner in the subdivision, the trustees of the subdivision, the City or such other maintenance entity or authority as may be proposed and approved by the City Council. Storm water detention facilities and drainage facilities shall be designated on the subdivision plat and restricted for use only for its intended purpose. Prior to receiving a building permit, the owner or developer shall have a deed recorded in their name for all lots containing restricted areas for storm water detention facilities and drainage facilities. The recorded deed shall contain detailed deed restrictions per Section 425.160. A copy of the recorded deed shall be submitted to the City prior to obtaining a building permit. If responsibility is to be transferred to the private individual owners in the subdivision, the developer shall assure perpetual maintenance of the drainage management facilities, including detention systems if any are included, through the adoption of maintenance agreements or covenants for any facilities that remain in private ownership. Such agreements or covenants shall be subject to the approval of the administrative officer. Copies of all agreements or covenants shall be provided to the administrative officer. If the responsibility is to be transferred to the trustees of the subdivision, the developer shall establish a suitable indenture of trust. Upon release of escrows required for the subdivision development, the responsibility for maintenance shall be vested in the trustees of the subdivision by virtue of the trust indenture. The indenture of trust shall clearly indicate resident responsibility for maintenance and shall be subject to the approval of the administrative officer. All storm water management system(s) shall have adequate easements, dedicated to the public for storm water management use, to permit the City to inspect and enter upon the property as necessary. Performance And Maintenance Security. Security against defects in workmanship shall be required for any portion of the drainage management facilities dedicated to the public. The terms of the performance security shall apply to any repairs needed and maintenance needed during the one (1) year period following completion. Inspection and repair of defects shall be required as a condition of release of the posted security. The applicant shall be required to adhere strictly to the storm water management plan as approved. Any changes or amendments to the plan must be approved by the administrative officer in accordance with the procedures set forth in this Chapter for obtaining storm water management plan approval. Enforcement officials shall be and are herein granted inspection rights and right-of-entry privileges in order to ensure compliance with the requirements of this Chapter. Engineer's Certification Of Construction. Upon completion of construction of the entire storm water management system, the developer shall provide written certification that the project has been completed and constructed according to the storm water management plan as approved by the City. Certification shall be sealed, signed and dated by an engineer registered in the State of Missouri. The purpose of this Chapter is to provide for the health, safety and welfare of the citizens of the City of Poplar Bluff through the regulation of non-storm water discharges to the storm drainage system to the maximum extent practicable as required by Federal and State law. This Chapter shall apply to all water entering the storm drain system generated on any developed and undeveloped lands unless explicitly exempted by the City administrative officer. Responsibility For Administration. The City of Poplar Bluff or its administrative officer shall administer, implement and enforce the provisions of this Chapter. Any powers granted or duties imposed upon the authorized enforcement agency may be delegated in writing by the administrative officer to persons or entities acting in the beneficial interest of or in the employment of the City. Ultimate Responsibility. The standards set forth herein and promulgated pursuant to this Chapter are minimum standards; therefore this Chapter does not intend nor imply that compliance by any person will ensure that there will be no contamination, pollution, nor unauthorized discharge of pollutants. The following discharges are exempt from discharge prohibitions established by this Chapter: water line flushing or other potable water sources, landscape irrigation or lawn watering, diverted stream flows, rising ground water, ground water infiltration to storm drains, uncontaminated pumped ground water, foundation or footing drains (not including active ground water dewatering systems), crawl space pumps, air-conditioning condensation, springs, non-commercial washing of vehicles, natural riparian habitat or wet-land flows, swimming pools (if dechlorinated, typically less than one (1) PPM chlorine), fire-fighting activities and any other water source not containing pollutants. The prohibition shall not apply to any non-storm water discharge permitted under an NPDES permit, waiver or waste discharge order issued to the discharger and administered under the authority of the Federal Environmental Protection Agency, provided that the discharger is in full compliance with all requirements of the permit, waiver or order and other applicable laws and regulations, and provided that written approval has been granted for any discharge to the storm drain system. Industrial Or Construction Activity Discharges. Any person subject to an industrial or construction activity NPDES storm water discharge permit shall comply with all provisions of such permit. Proof of compliance with said permit may be required in a form acceptable to the administrative officer prior to the allowing of discharges to the municipal separate storm sewer system (MS4). Access To Facilities For Monitoring Discharges. Applicability. This Section applies to all facilities that have storm water discharges associated with industrial activity, including construction activity. The administrative officer shall be permitted to enter and inspect facilities subject to regulation under this Chapter as often as may be necessary to determine compliance with this Chapter. If a discharger has security measures in force, which require proper identification and clearance before entry into its premises, the discharger shall make the necessary arrangements to allow access to representatives of the administrative officer. Facility operators shall allow the administrative officer ready access to all parts of the premises for the purposes of inspection, sampling, examination and copying of records that must be kept under the conditions of a NPDES permit to discharge storm water and the performance of any additional duties as defined by State and Federal law. The administrative officer shall have the right to set up on any permitted facility such devices as are necessary in the opinion of the administrative officer to conduct monitoring and/or sampling of the facility's storm water discharge. The administrative officer has the right to require the discharger to install monitoring equipment as necessary. The facility's sampling and monitoring equipment shall be maintained at all times in a safe and proper operating condition by the discharger at its own expense. All devices used to measure storm water flow and quality shall be calibrated to ensure their accuracy. Any temporary or permanent obstruction to safe and easy access to the facility to be inspected and/or sampled shall be promptly removed by the operator at the written or oral request of the administrative officer and shall not be replaced. The costs of clearing such access shall be borne by the operator. Unreasonable delays in allowing the administrative officer access to a permitted facility is a violation of a storm water discharge permit and of this Chapter. A person who is the operator of a facility with a NPDES permit to discharge storm water associated with industrial activity commits an offense if the person denies the administrative officer reasonable access to the permitted facility for the purpose of conducting any activity authorized or required by this Chapter. If the administrative officer has been refused access to any part of the premises from which storm water is discharged and he/she is able to demonstrate probable cause to believe that there may be a violation of this Chapter or that there is a need to inspect and/or sample as part of a routine inspection and sampling program designed to verify compliance with this Chapter or any order issued hereunder or to protect the overall public health, safety and welfare of the community, then the administrative officer may seek issuance of a search warrant from any court of competent jurisdiction. Requirements To Prevent, Control And Reduce Storm Water Pollutants By BMPs. The administrative officer will adopt requirements identifying best management practices for any activity, operation or facility that may cause or contribute to pollution or contamination of storm water, the storm drain system or waters of the U.S. The owner or operator of a commercial or industrial establishment shall provide, at their own expense, reasonable protection from accidental discharge of prohibited materials or other wastes into the municipal storm drain system or watercourses through the use of these structural and non-structural BMPs. Further, any person responsible for a property or premise, which is or may be the source of an illicit discharge, may be required to implement, at said person's expense, additional structural and non-structural BMPs to prevent the further discharge of pollutants to the municipal separate storm sewer system. Compliance with all terms and conditions of a valid NPDES permit authorizing the discharge of storm water associated with industrial activity, to the extent practicable, shall be deemed compliance with the provisions of this Section. These BMPs shall be part of a Storm Water Pollution Prevention Plan (SWPPP) as necessary for compliance with requirements of the NPDES permit. Watercourse Protection. Every person owning property through which a watercourse passes, or such person's lessee, shall keep and maintain that part of the watercourse within the property free of trash, debris, excessive vegetation and other obstacles that would pollute, contaminate or significantly retard the flow of water through the watercourse. In addition, the owner or lessee shall maintain existing privately owned structures within or adjacent to a watercourse, so that such structures will not become a hazard to the use, function or physical integrity of the watercourse. Notwithstanding other requirements of law, as soon as any person responsible for a facility or operation or responsible for emergency response for a facility or operation has information of any known or suspected release of materials which are resulting or may result in illegal discharges or pollutants discharging into storm water, the storm drain system or water of the U.S., said person shall take all necessary steps to ensure the discovery, containment and cleanup of such release. In the event of such a release of hazardous materials, said person shall immediately notify emergency response agencies of the occurrence via emergency dispatch services. In the event of a release of non-hazardous materials, said person shall notify the administrative officer in person or by phone or facsimile no later than the next business day. Notifications in person or by phone shall be confirmed by written notice addressed and mailed to the administrative officer within three (3) business days of the phone notice. If the discharge of prohibited materials emanates from a commercial or industrial establishment, the owner or operator of such establishment shall also retain an on-site written record of the discharge and the actions taken to prevent its recurrence. Such records shall be retained for at least three (3) years. It shall be the duty of the administrative officer to bring to the attention of the City Attorney any violation or lack of compliance herewith. Violations and penalties. Any person, firm or corporation who fails to comply with or violates any of these regulations shall be guilty of a misdemeanor and upon conviction thereof shall be fined not more than five hundred dollars ($500.00) per day of violation or be confined in the City Jail for not more than one (1) year, or both. Inspection. The administrative officer shall be responsible for determining whether the storm water management plan is in conformance with requirements specified in storm water management regulation and whether development is proceeding in accordance with the approved storm water management plan and permit. The administrative officer or his/her administrative officer shall make periodic inspection of the development site. Through such periodic inspections the administrative officer shall ensure that the storm water management plan is properly implemented and that the improvements are maintained. After construction is completed, the engineer shall submit a certification that all the work has been completed in accordance with the storm water management plan. Remedial work. If it is determined through inspection that development is not proceeding in accordance with the approved storm water management plan and permit, the City administrative officer shall immediately issue a written notice to the permittee and surety of the nature and location of the alleged non-compliance, accompanied by documentary evidence demonstrating non-compliance and specifying what remedial work is necessary to bring the project into compliance. The permittee so notified shall immediately, unless weather conditions or other factors beyond the control of the permittee prevent immediate remedial action, commence the recommended remedial action and shall complete the remedial work within seventy-two (72) hours or within a reasonable time after receipt of said notice. Upon satisfactory completion of the remedial work the administrative officer shall issue a notice of compliance and the development may proceed. Revocation of permits — stop orders. The administrative officer, after giving three (3) days' written notice, may revoke a permit issued pursuant to these regulations for any project which is found upon inspection to be in violation of the provisions of these regulations and for which the permittee has not agreed to undertake remedial work as provided in Subsection (A)(3). Permits may also be revoked if remedial work is not completed within the time allowed. Upon revocation of a permit the administrative officer shall issue a stop work order. Such stop work order shall be directed to the permittee and he/she shall immediately notify persons owning the land, the developer and those persons or firms actually performing the physical work of clearing, grading and developing the land. The stop work order shall direct the parties involved to cease and desist all or any portion of the work on the development or a portion thereof which is not in compliance, except such remedial work necessary to bring the project into compliance. Appeals. Any person aggrieved by a decision of the administrative officer may appeal any order, requirement, decision or determination first to the Board of Adjustment and then to a court of competent jurisdiction in accordance with the procedures set forth in Chapter 405 of the City Code of Ordinances entitled "Zoning Regulation", Section 405.330. General. Violation of the provisions of this Chapter or failure to comply with any of its requirements, including conditions and safeguards established in connection with variances or special use permits, shall constitute a misdemeanor. Any person who violates this Chapter or fails to comply with any of its requirements shall, upon conviction thereof, be fined no more than five hundred dollars ($500.00) or imprisoned for not more than three (3) months, or both, and in addition shall pay all costs and expenses involved in the case. Each day such violation continues shall be considered a separate offense. Corrective Actions. Nothing herein contained shall prevent the City from taking such other lawful action as is necessary to prevent or remedy any violation. All such costs connected therewith shall accrue to the person or persons responsible. This Chapter shall not in any way limit or modify the vested rights of any person to complete any development or improvements to lands based upon prior law, where a previous permit or authorization has been granted or applied for and where such previous permit or authorization remains in effect. The City may acknowledge vested rights in other circumstances where it is equitable and just. In the case of conflict within this Chapter or any part thereof and the whole or part of any other existing or future ordinance or code of the City, the most restrictive in each case shall apply. Before starting any work regulated by this Chapter, an applicant shall comply with the requirements set forth in all other applicable ordinances with respect to the submission and approval of preliminary and final subdivision plats, site plan drawing(s) for construction and rezoning improvement plans; and building, grading and zoning permits, along with those set forth in this Chapter and as may be required by State Statutes and the regulations of any department of the State. In the interpretation and application of this Chapter, the provisions expressed herein shall be held to be the minimum requirements and shall be liberally construed in favor of the City and shall not be deemed a limitation or repeal of any other powers granted by the State Statutes. Separability. If any part of this Chapter is held to be unconstitutional, it shall be construed to have been the legislative intent to pass this Chapter without such unconstitutional part, and the remainder of this Chapter, as to the exclusion of such part, shall be deemed and held to be valid as if such part had not been included herein. If this Chapter or any provision hereof is held to be inapplicable to any persons, group of persons, property, kind of property, circumstances or set of circumstances, such holding shall not affect the applicability hereof to any other person, property or circumstances. Abrogation And Greater Restrictions. It is not intended by this Chapter to repeal, abrogate or impair any existing easements, covenants or deed restrictions. However, where this Chapter imposes greater restrictions, the provision of this Chapter shall prevail. The performance standards and design criteria set forth herein establish minimum requirements which must be implemented with good engineering practice and workmanship. Use of the requirements contained herein shall not constitute a representation, guarantee or warranty of any kind by the municipality or its officers and employees of the adequacy of safety of any drainage management structure or use of land. Nor shall the approval of a storm water management plan and the issuance of a permit imply that land uses permitted will be free from damages caused by storm water runoff. The degree of protection required by these regulations is considered reasonable for regulatory purposes and is based on historical records, engineering and scientific methods of study. Larger storms may occur or storm water runoff heights may be increased by manmade or natural causes. Enforcement of these provisions, therefore, shall not create liability on the part of the municipality or any officer of the municipality with respect to any legislative or administrative decision lawfully made hereunder, not shall compliance relieve an owner, developer and/or permittee from responsibility under any circumstances where liability would otherwise exist.